The beauty of Northern California doesn’t stop on the coast. If you venture into the lush redwood forest, you’ll discover stunning treasures like the Mendocino Skunk Train! Travel back in time to the late 1890’s and go on an epic adventure through the countryside. Marvel at some of the most jaw-dropping landscapes, admire tall trees, rivers, and creeks, and have an afternoon like no other. The Mendocino Skunk Train is a once-in-a-lifetime kind of experience, and you do not want to miss it. 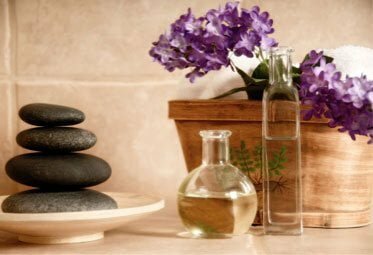 Read on to learn more about this fabulous day trip idea and start planning your visit to Sea Rock Inn today! Learn more about the Mendocino Skunk Train and other activities around Sea Rock Inn when you download our free Vacation Guide! Planning a vacation can be stressful, and this guide makes it easy. You’ll find top-notch recommendations for restaurants, outdoor adventures, hiking trails, state parks, beaches, quaint shops, fun events, and so much more! Our local guide has helped so many travelers maximize their stay, and we hope it does the same for you! The Mendocino Skunk Train is a local favorite that you have to try during your stay at Sea Rock Inn. Named the Best Rail Tour in the Country by USA Today and ranked among the Top 10 Family Activities in California by National Geographic Traveler, this legendary locomotive takes you through the most amazing landscapes you’ve ever seen. You’ll travel along the same rails used for logging over a century ago, and the experience is even more authentic in the 131-year-old Skunk Train. Pass through tunnels, bridges, meadows, and towering trees and get a glimpse of the abundant wildlife of Northern California. Tip: Keep your eyes open; you might see deer, egrets, and ducks near the Noyo River Canyon! The Mendocino Skunk Train offers two experiences depending on your needs and interests. The Northspur Flyer: The vintage rail cruiser takes you on a four-hour trip to the midpoint of the track at Northspur. Brace yourself for the 1,740-foot summit ascent and marvel on at the Noyo River Canyon nestled in the middle of the redwood groves. 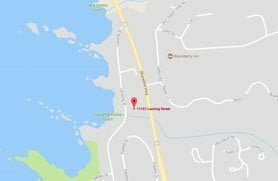 Pudding Creek Express: This 7-mile route departs from the Fort Bragg depot and goes all the way to Pudding Creek Estuary. It’s the perfect option for nature lovers, as you get to see many birds and animal during the hour-long tour. We recommend booking this expedition in the morning; the early light at dawn is magical. After spending a beautiful day riding the Mendocino Skunk Train, come back to a cozy room at Sea Rock Inn. 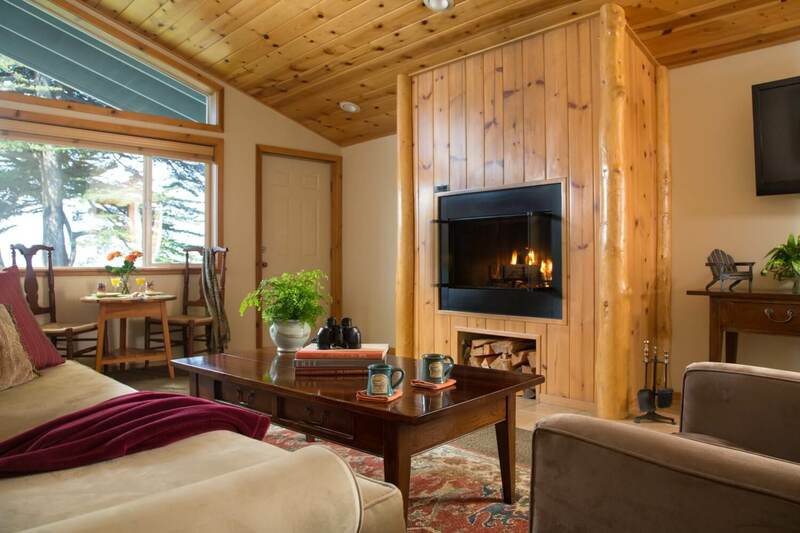 Our accommodations are perfect for couples who wish to get away from the city and reconnect with nature. 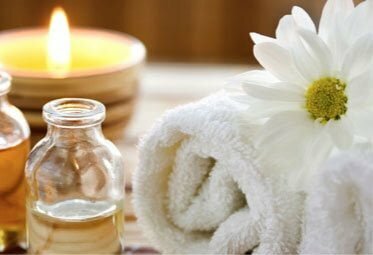 Spend some quality time with your significant other, relax in a soothing and serene atmosphere, and enjoy all the comfort of our modern amenities. Book one of our charming Suite 11 and enjoy a breathtaking view of the ocean right outside your window! 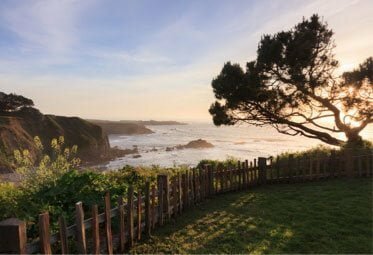 Get the tranquility you’ve been dreaming about for months; just you, the one you love, and the stunning Mendocino coast. Take a hot bath in your private bathroom, sip a glass of wine on the comfy couch, and get the best night of sleep you’ve ever had in the massive king bed. Wake up the next day to a delicious homemade breakfast and get ready for another day of exploration! 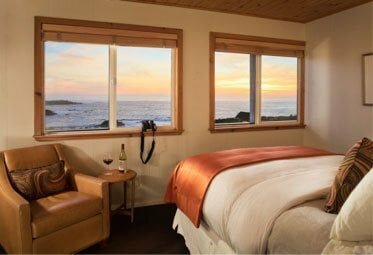 Book your stay today at Sea Rock Inn and uncover the secrets of Mendocino!